The MG TD can rightfully be described as the most popular of all the T series Midgets, following closely in the tracks of the TC Midget which was the car that put MG on a firm footing in the United States. The fact that the TC had become an overnight success in the American market helped secure a bright future for MG both at home and abroad. But whilst the Americans were still buying the TC in substantial numbers there were calls for a bigger and better updated car. It is worth noting that during 1948 and 1949 which was when the TC was at its peak of popularity, many changes were taking place in the Nuffield group with major management alterations and the new board transferring the production of Riley’s from Coventry to Abingdon in the interests of rationalisation. By the summer of 1949 the production of the TC was outnumbered by the manufacture of non-sports car models such as the Riley one and a quarter litre and the two and a half litre with the production lines running parallel to those of the Y type saloons and unsuccessful YT tourer. Because of the cool reception for the YT tourer it became clear in 1949 that overseas customers for MG sports cars particularly the Americans wanted something a bit more modern and sophisticated than the TC. Jack Tatlow who was new to the MG management and an ex-Riley man was set to work with Abingdon staff to come up with proposals for a new model to replace the TC. Abingdon was devoid of any investment due to all available money going to Cowley to develop new models there. However Syd Enever, Alec Hounslow and Cecil Cousins commenced work with a small design team to produce a prototype. This was all achieved in the space of two weeks without committing a pencil to the drawing board. Basically 5" was removed from the centre section of a YA saloon chassis frame and the two halves were welded together. A TC body was chopped up and stitched together and placed on the chassis and the end result was a rough and ready prototype that was acceptable to the Nuffield Organisation. The drawing office at Cowley then prepared accurate drawings from the prototype ready to put the car into production. The design team would no doubt liked to have produced something more sophisticated but bearing in mind the financial constraints on development the end result was a car that made commercial technical and product planning sense. Syd Enever decided that the new car should employ a more rigid chassis frame that would not distort under extreme bending and torsional stress and that it should have independent front suspension providing a more comfortable ride. Together with the Y type's advanced rack and pinion steering the car was far easier to handle and the overall package was a car salesman's dream. Another benefit incorporated into the design was the fact that the car could readily be assembled as a left hand drive version for the lucrative export markets. Underneath the body the Y type origins were fairly obvious with the large boxed frame chassis rails forming a very rigid platform for the independent suspension which was an exact copy of the Y type set up but utilising larger dampers. At the rear the chassis departed from its saloon car ancestor in that the frame swept up and over the rear axle instead of being underslung. The rear axle was of modern hypoid design borrowed from Morris and Wolseley contemporaries and the gearbox was a Y type unit with a remote control gear stick. The XPAG/TD engine although bearing a strong resemblance to the TC engine was in fact also derived from the Y type XPAG/SC engine. It is true to say that the XPAG engines were all essentially the same but on the TD version the clutch housing, dynamo, sump, rocker cover, starter motor and engine mounts were all straight from the Y type. The TD body was no doubt inspired by earlier MG two seaters but it was considerably wider than earlier models to give more elbow room. 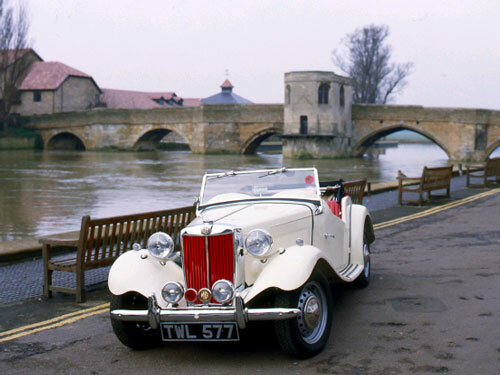 The car was welcomed as it was the first MG since 1936 to incorporate some major styling changes. Every panel was different to that of the TC and the fascia although new, remained strictly traditional as did the separate flowing front wings, running boards, separate headlamps and the characteristic vertical slat MG radiator. A centrally hinged bonnet and exposed slab fuel tank with spare wheel carrier at the rear completed the package. Other features that were still thought to be important and in keeping with MG tradition were the cutaway doors, folding screen with wiper motor bolted to the passenger side top rail and basic slot-in side screen weather protection. The classic coach built type body panels were mounted on to the traditional ash wooden frame. In the cockpit facilities remained fairly basic with no provision for a fresh air heater or a radio and the lack of any individual adjustment on the front seats. Direction Indicators, now common on a lot of cars were noticeably absent as a standard fitment. One new addition to the TD was the fitting of sturdy chromium plated bumpers and overriders front and rear. These weighty additions were not welcomed by enthusiasts but were essentially fitted to protect the car against the poor parking techniques employed by the drivers of lumbering North American vehicles! Another controversial move was the fitting of smaller pressed steel disc wheels in place of the traditional wire spoked wheels used on the TC. This was done because special wheels would have had to be made to accommodate the arms and links of the new rack and pinion steering and Nuffield would not have sanctioned this for use on one model alone. A strong point was made in favour of the disc wheels in so much as they were far easier to keep clean and maintain and did not distort and buckle when negotiating the potholed British roads, unlike wire wheels which were very prone to damage. The TD was certainly less lively than its predecessor mainly due to an increase in weight of nearly 200 lbs and the fact that the engine produced the same peak power and torque as the TC ie 54bhp @ 5,200rpm. 641 lb/ft @ 2,600rpm. Even with lower gearing, the lowest in fact of any T series production car independent road test figures of the day indicated that the TD was slower than the TC. Despite these minor disadvantages, would-be customers flocked to buy the car when it was introduced in late 1949. Over the 4 years the car was in production, 29,664 models were to emerge from Abingdon which was over three times the number of TCs made, it was also a new production record for MG with a staggering 10,838 being produced in 1952 alone. With raw material supply becoming easier and cheaper after the war and the huge following for British sports cars in North America, this new MG with improved road holding and passenger comfort had immediate appeal. The main factor that helped the export sales to America was the fact that Sterling was devalued in September 1949 making British products far more attractive and cheaper to customers abroad. Despite the success story the TD was a controversial car in its day giving rise to much debate in motoring journals and at enthusiasts pub gatherings, nonetheless it has earned its place in history as a highly desirable classic British Sports Car. MPH: 14.5 per 1000rpm in top gear. Clutch & Gearbox: Single plate dry clutch. Four speed gearbox with synchromesh on top three gears. Suspension: Independent front by coil and wishbone. Non-independent rear by semi elliptic leaf springs with Luvax Girling dampers. Brakes: Lockheed hydraulic with 2 leading shoes at front. 9" drums front and rear. Track: 3'11.5" front. 4'2" rear. Fuel consumption: approx 26.7 miles per gallon. Prices new in 1953: £500 plus £221 19s 2d purchase tax. Total £751 19s 2d.